Coding procedures that go beyond information-theoretic limitations on classical codes, and much more! The quantum computing group at CMS benefits from a close collaboration with Caltech’s Institute for Quantum Information and Matter, partly co-located within the same building. As a result our research takes a strong interdisciplinary bent. Our approach consists in identifying challenges in quantum information and the study of quantum systems for which the use of computer science techniques, from algorithms, complexity, cryptography or information theory, can lead to major advances. A sample recent focus of interest of our group has been the study of the computational consequences of “quantum weirdness”: we approach the nonlocal properties of entanglement from the complexity-theoretic (multiprover interactive proofs) and cryptographic (device-independent quantum key distribution) vantages. Inspired by our collaborators from physics we develop classical and quantum algorithms for the simulation of quantum mechanical systems, contributing to the understanding of new phases of matter. We are also excited by the prospects of topological architectures for quantum memories and quantum error-correcting codes. Our point of view is that quantum computing is not the future: it is the present! Quantum mechanical systems are everywhere, with a strangeness and power that is only awaiting a computational mindset to be properly understood and harnessed. ACM/CMS 104. Linear Algebra and Applied Operator Theory. ACM/CMS 113. Introduction to Optimization. Ma/CS 117 abc. Computability Theory. CS/EE/Ma 129 abc. Information and Complexity. Physics 135b. 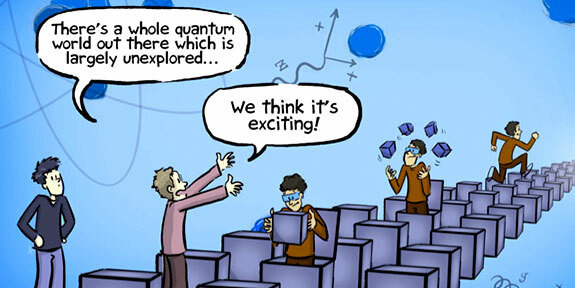 Applications of Quantum Mechanics: Quantum Computing. CS 138 abc. Computer Algorithms. CS/CMS 139. Analysis and Design of Algorithms. CS 150. Probability and Algorithms. Physics 195. Advanced Quantum Mechanics. Ph/CS 219 abc. Quantum Computation. SS/CS 241. Advanced Algorithmic Economics. CS 286-2. Topics in quantum information.